Turkey's President Recep Tayyip Erdogan, backdropped by a portrait of Turkish Republic founder Mustafa Kemal Ataturk, talks to members of the media in Istanbul, prior to his departure on a Mideast tour, Feb. 12, 2017. The Turkish President Recep Tayyip Erdogan has signed into law constitutional amendments aimed at giving him sweeping new powers under an executive presidency. The reforms are deeply divisive, with supporters saying they will strengthen democracy, while critics warn of dictatorship. Turks will decide in a referendum set for April 16. Doubts over its fairness are growing among opponents of the reforms, who claim a crackdown against them already has started. “We look for democracy in darkness and hopefully on April 16th we will find democracy coming out of the ballots,” she later said to reporters. 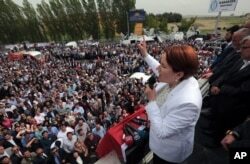 Aksener's rally received scant coverage by the mainstream media, being confined to fringe opposition publications and TV channels broadcasting on the internet. Analysts say that's because much of the mainstream was directly or indirectly under the influence of Erdogan, what remains increasingly avoids critical reporting. FILE - Meral Aksener. a former Interior minister, addresses supporters as riot police sealed off a hotel to prevent thousands of dissidents from holding a party congress in Ankara, Turkey, May 15, 2016. Turkey's Nobel Prize winner for literature, Orhan Pamuk, said he gave an interview to a newspaper, but it declined to publish his comments because he said he would cast a “no” vote on the referendum. Additionally, a leading news anchor said he was fired after he tweeted his opposition. A top Turkish constitutional law expert, Professor Ibrahim Kaboglu of Istanbul's Marmara University, also says he and other colleagues were let go from their jobs for voicing their opposition to the reforms. Turkey has been under emergency rule since July's failed coup attempt. It allows the president and his government to dismiss any state employee. Concerns over the neutrality of the state in the forthcoming referendum are increasingly being raised. FILE - Turkish authors Orhan Pamuk, left, and Murat Belge leave Kartal Justice Palace after Belge appeared in court on charges of insulting Turkish President Tayyip Erdogan in Istanbul, May 3, 2016. The president argues that emergency rule is essential to guaranteeing the security and safety of the referendum. But concerns over the use of emergency powers against campaigners who vote “no” grew with Erdogan's warning that those who oppose his reforms are in the company of terrorists. “Who says no to these reforms? The PKK terrorist says no. Who says no? The coup plotters say no. Who says no? Those who want to divide this country say no. Only those who are against the flag say no,” Erdogan thundered. A supporter holds a portrait of Selahattin Demirtas, detained leader of Turkey's pro-Kurdish opposition Peoples' Democratic Party at a meeting at the Turkish parliament in Ankara, Nov. 8, 2016. Police are continuing to carry out dawn raids under emergency powers, arresting thousands of members of Turkey's second-largest opposition party, the pro-Kurdish HDP. Those detained include its charismatic leader, Selahattin Demirtas, widely recognized as one of the most lucid opponents of the proposed executive presidency. Soli Ozel, an international relations expert from Istanbul's Kadir Has University, questions whether the vote will be fair. “I think this will be very uncomfortable for the naysayers to be able to push their line of thinking, because the last two elections we've held have not really been either as fair or free as we've come to expect. For better or worse, that is one thing Turkey has done very well; that is, we held elections fair and free; that has been infringed upon in my view. I can easily imagine the yes camp will monopolize [media] air time and the no camp will not have all that much of chance to explain itself. But on the other hand, I also see a serious potential for a ‘no’ vote; will it be mobilized properly? I don't know,” said Ozel. Opinion polls indicate the outcome remains too close to call. That is giving the “no” campaign hope, but the expectation of further crackdowns on their activities can only deepen the country's political divide.